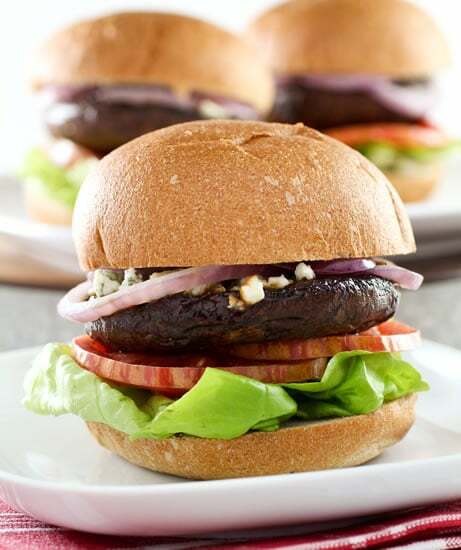 These portobello mushroom blue cheese burgers have long been one of my favorite grilling recipes. 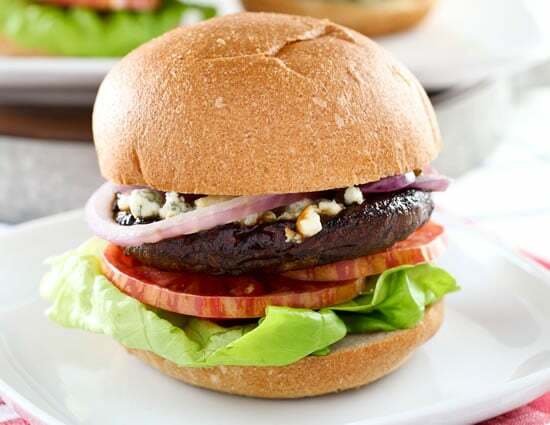 The sweetness of the mushrooms is balanced by the tang of the cheese, and once you pile on all the usual burger fixin’s you’ll never even notice there’s no burger in your burger. These take about three minutes to prepare: rinse the mushrooms, cut off any large stems, and toss them in a zip-top bag or re-sealable container with the rest of the marinade ingredients. You can do all of that the night before your BBQ, and toss them straight on the grill when it’s time for dinner. Or, if you’re like me and don’t usually plan that far ahead, just marinate at least 30 minutes – an hour if you can wait that long – before grilling. These easy-to-prepare mushrooms are hearty enough that you won't feel like you're missing anything when you skip the meat. 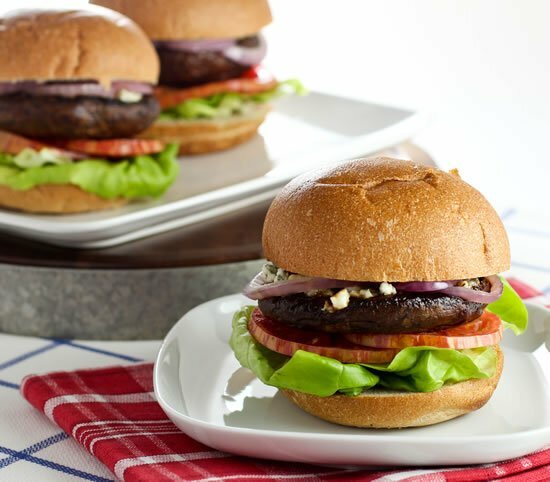 Serve them with the typical burger fixin's: Thinly sliced red onion, sweet heirloom tomato, and crisp butter lettuce on a 100% whole grain bun. Cut the stems off the mushrooms and wash gently. Place the mushroom(s) and the other ingredients, except the cheese, in a sealed container or large zip-top bag, and gently flip over several times to coat the mushrooms. Refrigerate, flipping every once in awhile. These are best if you can marinate them for at least a few hours (better yet, overnight), but an hour or two will do. On the grill, place the mushrooms gills-down first, and cook without moving for about 5 minutes. They become very fragile as they cook, so it's best to move them as little as possible. Gently flip them over and crumble the blue cheese onto the gills. Cook for a few more minutes as the cheese melts on top. To test for doneness, give the mushroom a little squeeze with a pair of tongs. If they bend easily throughout (not just the edges), that means they're cooked all the way through. Kelly rocks – first thing I noticed was the fantastic shot. I was quite impressed with how well-styled it was, as well…Terrific recipe. This needs to happen in my kitchen soon! Love it!